Rangers huffed and puffed but two Martyn Waghorn strikes eventually broke down a resolute and gutsy Dumbarton. 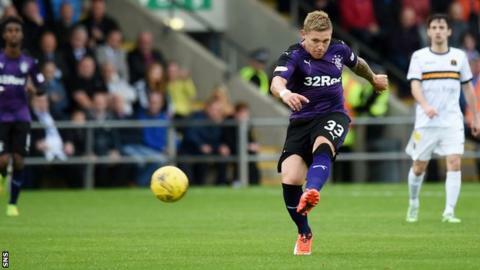 Waghorn's 10th and 11th goals of the season maintained Rangers' perfect points record in the Championship. The striker's first was a 20-yard left-footed drive and his second came from the spot after Gregor Buchanan was sent off for felling Kenny Miller. The Sons pulled one back through Garry Fleming's penalty after Danny Wilson fouled Frazer Wright. Whether it was through a resolve to not become the seventh team to concede five goals to Rangers this season, or because this marked their 300th competitive game at what is now called the Cheaper Insurance Direct Stadium, Dumbarton had their visitors between a rock and a hard place. The pink boots of Willie Gibson were the source of some early jitters for Rangers, with the winger narrowly missing with a high, curled free-kick before crossing for striker Fleming to head firmly against the inside of Wes Foderingham's post. The half-hour mark passed without Rangers creating a clear-cut chance as the well-drilled Sons rear-guard of Buchanan, Darren Barr, Mark Docherty and Grant Gallagher snuffed out what came their way. Barr even found time to direct a header into the arms of Foderingham from another testing Gibson delivery and Scott Brown blazed over when well-placed for a shot. In fact it was the 45th minute when James Tavernier's rocket from the edge of the box was tipped over by Dumbarton goalkeeper Mark Brown to register Rangers' first proper shot on target. The Englishman then almost made it seven for the season with a free-kick that smacked the outside of the upright. Just when an hour had passed and Dumbarton manager Stevie Aitken's plan appeared to be working, Waghorn picked up the ball and hit a sweet strike beyond Brown, who may have been slightly unsighted. Harsh on the Sons who went two behind 10 minutes later. A through ball had Miller bearing down on goal and Buchanan seemed to get tangled up with him as the former Scotland striker shaped to shoot. Referee Alan Muir dismissed Buchanan and Waghorn stepped up to dispatch his penalty into the left corner. Wilson's foul on Wright at a set piece allowed Fleming to get his third of the season from the penalty spot, with Foderingham getting a touch but not enough. Match ends, Dumbarton 1, Rangers 2. Second Half ends, Dumbarton 1, Rangers 2. Goal! Dumbarton 1, Rangers 2. Garry Fleming (Dumbarton) converts the penalty with a right footed shot to the bottom right corner. Dominic Ball (Rangers) is shown the yellow card. Penalty conceded by Danny Wilson (Rangers) after a foul in the penalty area. Penalty Dumbarton. Frazer Wright draws a foul in the penalty area. Attempt saved. Andy Halliday (Rangers) left footed shot from outside the box is saved in the top right corner. Substitution, Dumbarton. Calum Waters replaces Mark Docherty because of an injury. Substitution, Rangers. Fraser Aird replaces James Tavernier. William Gibson (Dumbarton) is shown the yellow card for a bad foul. Substitution, Dumbarton. Frazer Wright replaces Kevin Cawley. Goal! Dumbarton 0, Rangers 2. Martyn Waghorn (Rangers) converts the penalty with a left footed shot to the bottom left corner. Gregor Buchanan (Dumbarton) is shown the red card. Penalty Rangers. Kenny Miller draws a foul in the penalty area. Penalty conceded by Gregor Buchanan (Dumbarton) after a foul in the penalty area. Danny Wilson (Rangers) wins a free kick in the defensive half. Goal! Dumbarton 0, Rangers 1. Martyn Waghorn (Rangers) right footed shot from outside the box to the centre of the goal. Lee Wallace (Rangers) is shown the yellow card for a bad foul.